May you all enjoy this Memorial Holiday and may we all take a moment today to think about the sacrifices made to make the USA the Home of the Brave and the Land of the Free. May we never lose sight of the cost of being the greatest country in the world. We got home in the wee hours yesterday morning. It was a wonderful trip and I will be sharing our last day when we toured the Island later this week. But today? 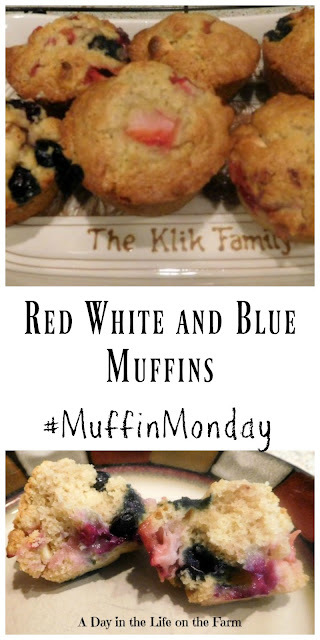 Today is Muffin Monday as well as Memorial Day so I am sharing with you some Red White and Blue Muffins that are quick, easy to make and will provide a festive treat for you today. Muffin Monday occurs the last Monday of each month when Stacy of Food Lust People Love invites bloggers to post a muffin recipe of their choice. There is no theme but your muffins must be made in the "muffin" fashion. That is mixing together the dry ingredients. Whisking together the wet ingredients and then combining the two. I adapted this recipe from one found at Taste of Home. I liked it not only because it was perfect for Memorial Day but also because it only makes 6 Muffins which is perfect for the 2 of us. While these are not the most beautiful muffins I have ever made, they were certainly right up at the top in the taste department. You will find links to all the other muffins being shared today at the bottom of this post. Have a Blessed and Safe Memorial Day Celebration. Celebrate Memorial Day, Fourth of July or just your love of the USA with these delicious and tender muffins studded with strawberries, blueberries and white chocolate chips. Combine the flour, sugar, baking soda and nutmeg in a bowl. Set aside. Whisk together the egg, oil and milk. Make a well in the dry ingredients. Pour the wet ingredients into the well and stir just until combined. Stir in the strawberries, blueberries and white chocolate chips. Divide the batter between 6 muffin tins that have been treated with baking spray or lined with paper cups. Bake in a preheated 375* oven for 18-22 minutes, until a skewer inserted removes cleanly. I wasn't sure what to expect when I saw your title, Wendy, but these are just perfect for Memorial Day. Delicious and naturally red, white and blue! These sound delicious. I am so impressed that you made, photographed, and posted these after getting back from your trip! You are amazing.